Do you believe that the love story of your life is written in the stars? Well, so do we. We finally have a way of telling you whether you found the one or not, straight from the stars. 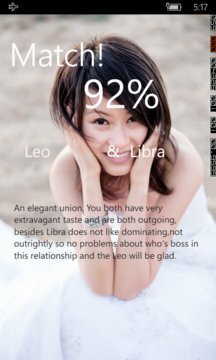 This app gives you a percentage score of your compatibility and even gives you some advice to go with it.